As you can guess this means I have too much on my plate to write today. There’s plenty coming that’s in bit and pieces behind the scenes. Something on peer review. More on recent popular science books. How protein domains evolve. A means that proteins might use to tolerate desiccation, enabling some microbes to live in very dry conditions. Another look at epigenetics the 3-D structure of genes (I’ve a lot to say on this topic!). And on the list goes. In the meantime, below is a list of some articles from 2009 that newer readers to my blog may not have seen. 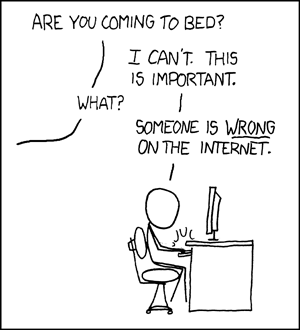 Or you could take yourself over to xkcd.com, where the cartoon is from, pick out your favourites and let us know. One of my favourites is one I put up for Valentine’s Day. Keep well, and feel free to pop up in the comments.